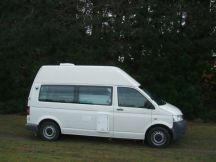 2006/07 Volkswagon T5s Diesel (or petrol model) manual, provides plenty of space and sleeps 2 adults and a child. Its layout features a 2-way fridge, gas cooker with 2 burners and grill, on board running cold water (into sink) and plenty of storage. The 2 single beds in the back convert to a double with the 3rd bed located above. Please note: must hire the portable chemical toilet @ NZ$25 per rental for the Certification Self-Contained permit to apply. One baby seat can be fitted in this vehicle. This motorhome offers plenty of space for the family and for entertaining without compromising its driveability. At just 6.35 metres it features a front lounge with a 4 seater dinette. The well equipped kitchen and bathroom separate the lounge from the rear bedroom which accommodates 2 x single bunk beds. Under the bottom bunk is a large storage locker. 2011 Ford Transit. You are viewing page 5 of 28.